Congrats to our Pet Star Coin Drive contestants! From July 5-19, 2016 these 5 animal advocates collected a total of $2,050 for the organization of their choice! Each organization will receive the jars of coins each contest collects, and all the contestants won prizes from Subway, Wal-Mart, Ripley's Aquarium, Titanic Museum, and The Humane Society of the United States! It's definitely a win-win competition! Our WINNER of the Jurnee's Journey Pet Star Coin Drive is Tiffany Porter! She raised $833.44 for The Bridge Home No-Kill Animal Shelter! 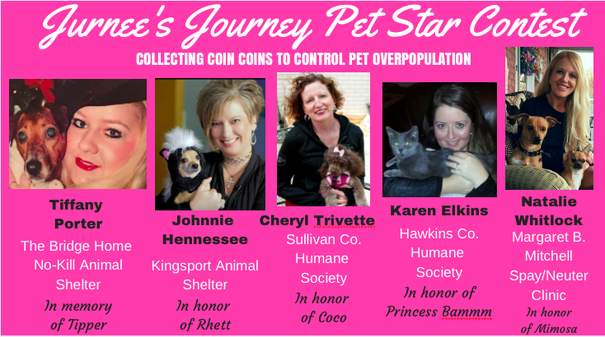 2nd place in the Jurnee's Journey Pet Star Coin Drive contest is Karen Elkins, who raised $817.04 for Hawkins County Humane Society! Presenting $833.44 to The Bridge Home No-Kill Animal Shelter! Presenting $817.04 to the Hawkins County Humane Society!